Topical THC & CBD | Transdermal Cannabis | Pain & Anxiety Relief — CBD vs. THC: What’s the Difference? The growing cannabis industry has brought forth a host of cannabis related products, often infused with some form of CBD, THC or both. Many people assume that THC (tetrahydrocannabinol) and CBD (cannabidiol) are the same type of cannabinoid, or that they both are found exclusively in Cannabis Sativa Sativa and Cannabis Sativa Indica. In actuality, the differences in both the chemical structural as well as the source of isolation for both of these cannabinoids are rather distinct. The legality of CBD-containing products, versus THC products may also be made more easily understood based on these distinctions. What are the effects of CBD as opposed to THC? CBD is a cannabinoid which is primarily responsible for the well-known sedative and appetite stimulating effects. THC is the cannabinoid associated with and responsible for the psychoactive and expressive effects following cannabis use. How are CBD and THC isolated from Cannabis? Much of the cannabis which is processed for ingestion by smoking is of two varieties: Cannabis Sativa Sativa (rich in THC and lower amounts of CBD) and Cannabis Sativa Indica (rich in CBD with lower amounts of THC). 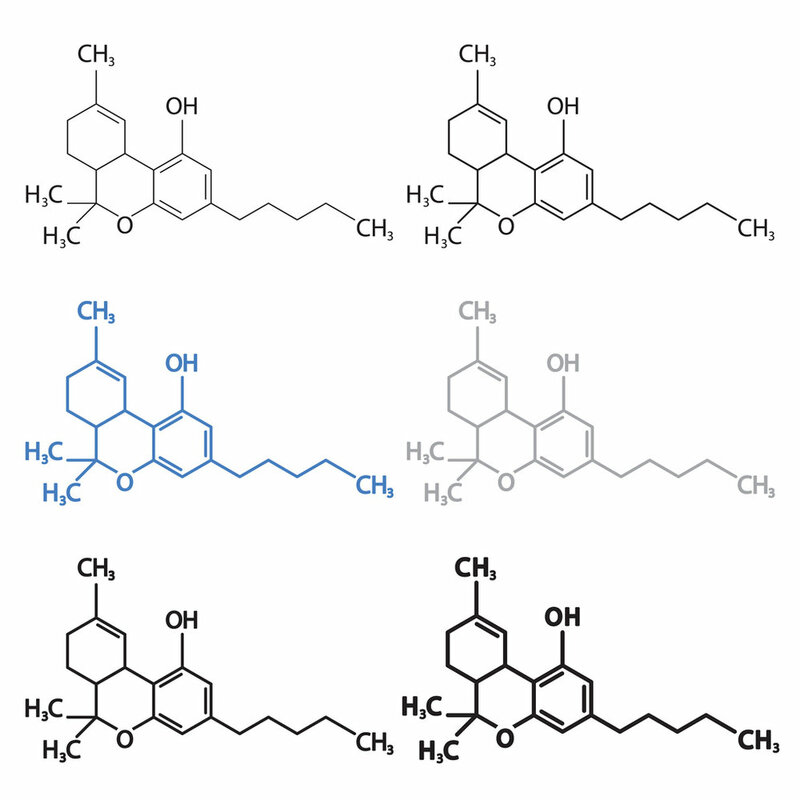 A wide variety of hybrids exist with customized ratios of CBD to THC, however, there is another type of cannabis from which most CBD is isolated for use in products. Cannabis Ruderalis--or hemp--is a type of cannabis which possess no THC and only trace amounts of CBD. Through natural refining processes, the CBD from hemp may be extracted with its chemical structure intact for use in therapeutic products. This is also how companies, like Evolve Formulas, which are not licensed as dispensaries are still able to legally sell CBD infused products. Which of these two cannabinoids is safer to ingest? Both THC and CBD are safe to ingest, in an immediate sense. It should be well-noted, however, that for people on certain types of medication or struggling with certain psychiatric conditions (such as Bipolar Disorder I or II, or Schizophrenia) THC is contraindicated and should be avoided. CBD does not cause disruptive effects in the aforementioned individuals, and because its effects are not psychoactive but rather physical and therapeutic, it is most commonly used in cannabis-derived wellness and lifestyle products. CBD was also the first cannabinoid to be embraced by the medical community as a viable and legal cannabis-based treatment for patients convalescing from or managing serious diseases like cancer and ALS. Now, with a better understanding of these cannabinoids, you may feel more at ease about CBD infused products with respect to legality as well as the therapeutic effects. There are still many misconceptions about the formulation of various CBD extracts, oils, and salves and many people are often concerned about psychoactive side-effects which may render them unable to drive or operate heavy machinery. For CBD-infused wellness products featured on EvolveFormulas.com, which were legally formulated and are not dispensary-grade, there exists no such side effects. Indeed, the mild and soothing benefits could be compared to that of a pain-relief topical cream mixed with the relaxing effects of aromatherapy.